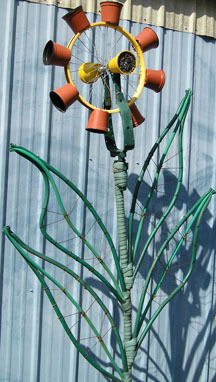 In addition to birdhouses, we have been creating functional garden art from recycled objects. Our first collaborative piece was an entry for an Artist's Challenge contest. The challenge was to create a trellis from garden hoses & plastic pots. Our kinetic trellis features a bicycle fork and wheel flowerhead which pivots and spins with the wind. 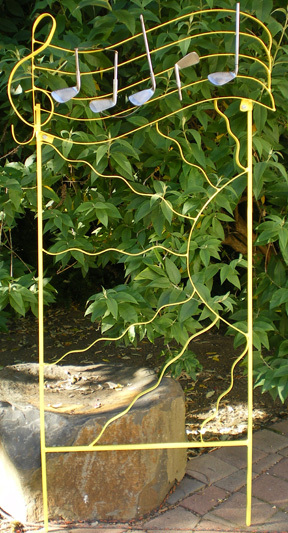 Our trellis won the contest and we've enjoyed creating kinetic art ever since. 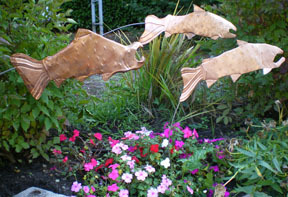 These playful copper salmon are mounted on arching poles allowing them to gently move with the wind as they swim in your garden. 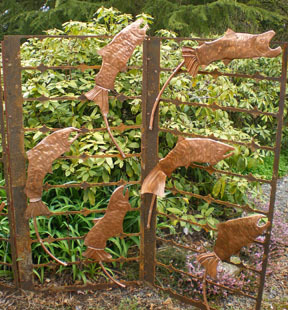 Each one is hand formed from salvaged copper and a portion of the proceeds from all "Salmon" art are donated to the Wild Salmon Center. 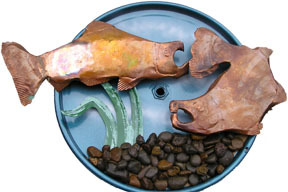 Salmon are hand formed from salvaged copper. They are depicted making their epic journey upstream – “climbing the fish ladder” to return to the site of their birth and spawn. Trellis panel is a salvaged steel skeleton. Unique hinging system easily allows multiple trellis panels to link together and level with the ground. A portion of the proceeds from all "Salmon" art are donated to the Wild Salmon Center. 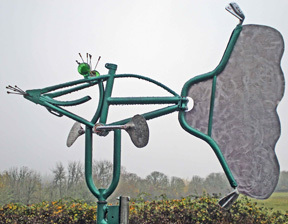 This whimsical creature turns as his pedals "swim" with the wind. He's made from a bicycle, golf clubs, and other salvaged items and of course, we made him smile! 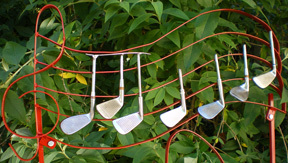 What to do with old golf clubs... Make Music! 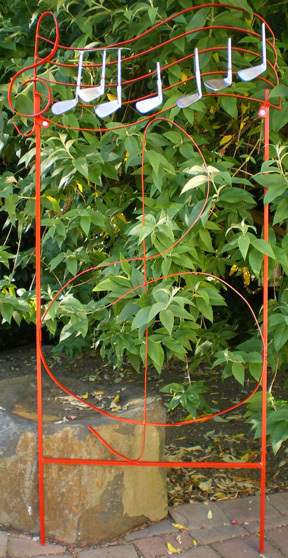 These will either hang on your fence, on the wall, or buy a trellis to go with them and add some music to your garden. Other songs available -- just send us an email for more info. Have you ever noticed how even the most beautiful home is marred by an unsightly garden hose drooping off the house? With this challenge in mind, we are creating a series of artistic hose reels. Our design, which mounts on the wall, winds and hides the hose neatly behind it. Two of our inital designs are shown below. Our salmon design is titled "Ancestral Gravel" and features two copper fighting male salmon at spawning time. 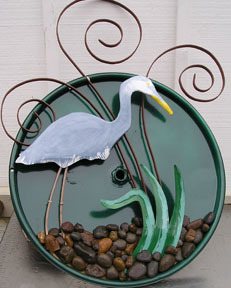 The other design is titled "The Great Blue Heron" and celebrates Oregon's committment to preserving habitats. This is an exciting new project and we have a number of sketches for future designs. Click here to email for more information. Hi, I'm Bob the ShishkaBob man. I came to life from the bottom of the scrap pile. I’m recycled – my body is from industrial cutoffs, my head is industrial surplus and I’m mounted on a grate from the salvage yard. 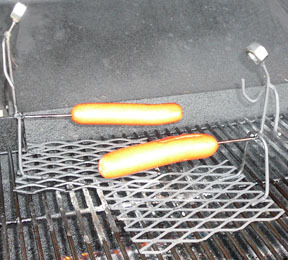 Instead of being melted down as scrap metal, I was made strong to provide many years grilling. I love to grill hot dogs, bratwurst, toast marshmallows, or my favorite – make shishka bobs! I hope you’ll invite me to all of your cookouts. Why not take me and a few of my friends home and have a party? I'm only $25 or $45 for me & a friend! I'm available at shows, or click here to email for more information about having me shipped. 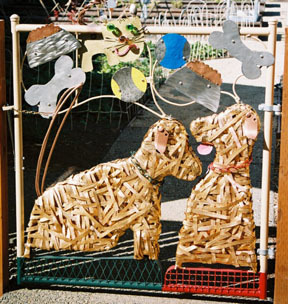 This garden gate is a tribute to Our Best Friends. It’s inspired by Brooke & Bunny, two wonderful yellow labs who spend countless hours napping in the garden. We wondered what they dream about while they lie in the sun, fast asleep. During their naps, their ears start twitching, tails wag, and paws tremble as if they’re running across an open field. Our guess is they dream about chasing their ball, finding that big bone somewhere in the garden, catching that pesky kitty cat, or discovering a supper dish full of an endless supply of kibbles… This entire gate is from salvaged items -- Brass industrial cutoffs stove piped on an antique machine forms their bodies and their balls, bones & supper dishes are from a stainless steel commercial kitchen backsplash. In addition we used aircraft heim joints to wiggle their ears and create the moving tail which serves as a gate latch. 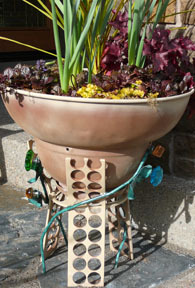 Garden planters provide a wonderful opportunity for creative design as just about any object can become a planter. These planters are former industrial heaters, and the stands are made from industrial remnants, decorated with Aurora Glass seconds drawer pulls. Creating art from recycled materials is an exciting journey. If you find yourself smiling while looking at our work, then we know we've achieved success.